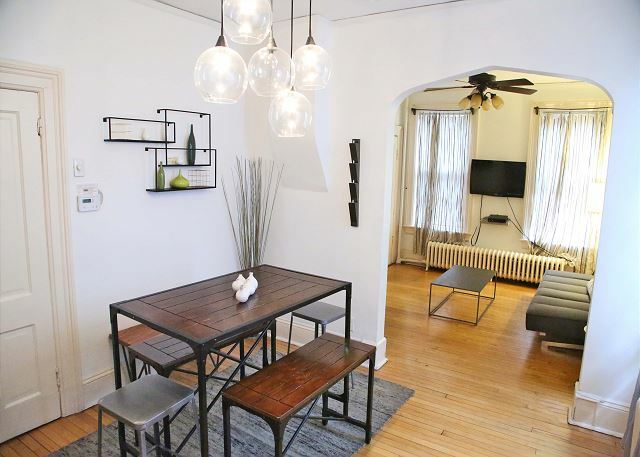 The Biddle House is located in historic Old Town on a quiet tree-lined street, walking distance to wonderful restaurants, shops and the lakefront. Public transportation is a breeze from here - get downtown in 10 minutes on Chicago's famous El train (brown line)! You'll be a short walk from the Sedgwick Brown Line stop. 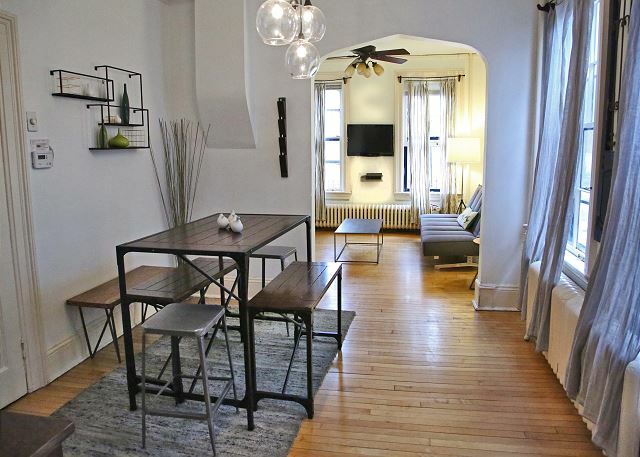 There are two fully furnished rental apartments available at the Biddle House. Each has two bedrooms, one bathroom, a fully equipped kitchen, dining room and living room. The units here get great natural light as well! The apartments include high-speed internet (wi-fi), cable tv, private phone lines, and complimentary washer and dryer in the building. The 2nd floor apartment has one queen size bed in each bedroom and a twin size sleeper sofa in the living room. There is a single Jacuzzi tub and shower in the bathroom. 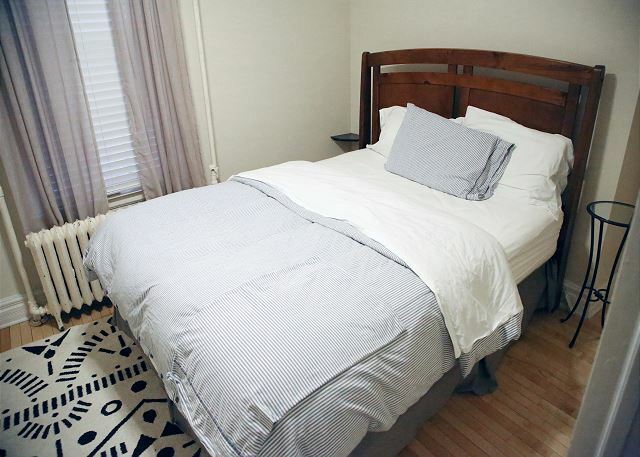 The 1st floor apartment has a queen size bed in one bedroom and a double in the other bedroom. A sleeper sofa is available for use in the living room. The bathroom has a bathtub and shower. Max occupancy per apartment is 12. Closest major intersection is North Avenue and Sedgwick Street. 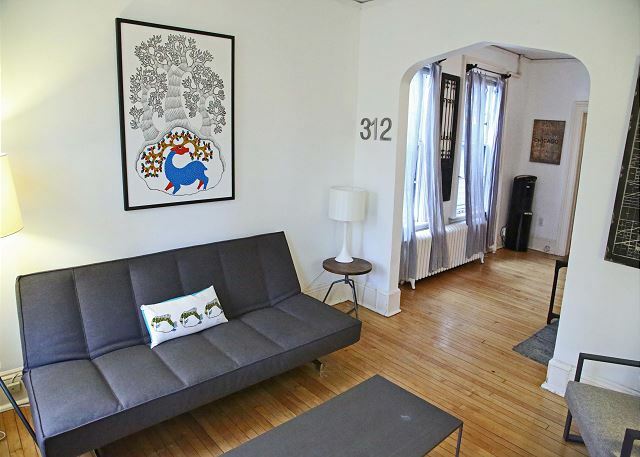 You'll be a short walk from the Lincoln Park Zoo, Chicago History Museum, world-famous Second City, great restaurants and bars like Twin Anchors (an old Sinatra hangout), Old Town Social, and Perenial Virant. It was a great location to stay in. Old Town is a lovely neighborhood away from the craziness of the city. But close enough to visit the city and attractions everyday. EL train stop is just 3 blocks away. The unit was a nice place to hangout inside or out. There is not alot of frills in the unit but we didn't spend much time there anyway. It was great to be able to spread out and have the extra bedroom for our son to have his own space. As a suggestion, it would be great to have some chairs to sit outside on, a cart to carry back groceries, and maybe even some access to bikes as I have experienced on other rentals. And maybe even some park supplies to go for a picnic at the nearby Lincoln Park or beach. Enjoyed our stay!!! Thanks. 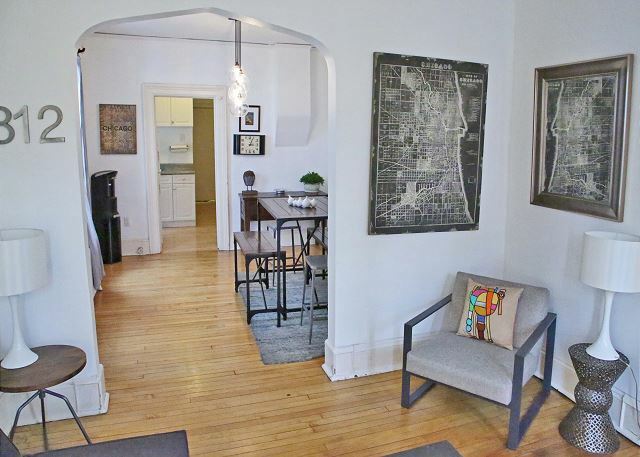 The Biddle House is perfectly situated to explore Chicago- steps from the El Brown line, Old Town, pubs, the lake and close to Lincoln Park. We really enjoyed being in the middle of a residential neighborhood full of lovely homes. Three complaints, two of them small. The home is in need of window replacement- we had warm weather and could only crack two windows, and there is no air conditioning. We had a doorknob fall off a bedroom door and the welcome binder left by At Home Chicago was clearly written for another property, as the information did not apply to this neighborhood. Otherwise, we were really happy! Location was fantastic, and truly everything was walkable (unless you have a teenager who hates to walk). Within minutes we were in Lincoln Park and then on Lake Michigan, half hour walk to the heart of Chicago. The condo was furnished with kitchen necessities and laundry, only thing missing was a dishwasher. Bathroom was fairly small, looked like an add-on to this older house. Mattresses a bit soft, but we still slept well.